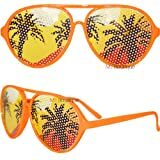 A novelty set of 12 sunglasses for use at a Florida themed party. Also a great addition to a Moving to Florida party. File this one under tropical party supplies.